In the following program user would be asked to enter two strings and then the program would concatenate them. For concatenation we have not used the standard library function strcat(), instead we have written a logic to append the second string at the end of first string. * You can also use strlen instead of this. 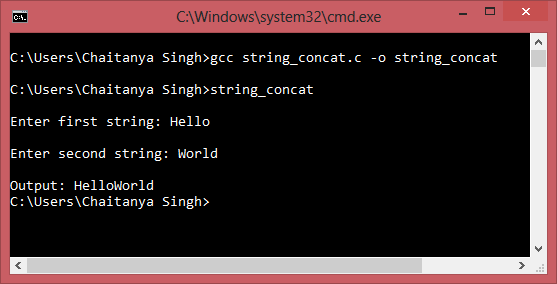 As you can see we have entered two strings and in the output of the program both the strings got concatenated.